Seventh-grade teachers celebrated the academic success of more than 60 students at North Junior High on April 10. The recognition breakfast event honored students for their GPA. New this year, the teachers also nominated students to receive an award that embodies each of the IB Learner Profiles traits. Teachers nominated students and then voted on the two winners for each of the IB Learner categories. “We want to recognize students for their achievements, as well as for their demonstration of attributes—like being reflective, principled, balanced, thoughtful, and curious—we know will serve them well as they navigate the complex world into which we send them everyday,” said Debbie Hahn, community project coordinator at North Junior High. The early morning started with a homemade breakfast made by the seventh-grade teachers. The breakfast consisted of pancakes with fruit toppings, eggs and orange juice. 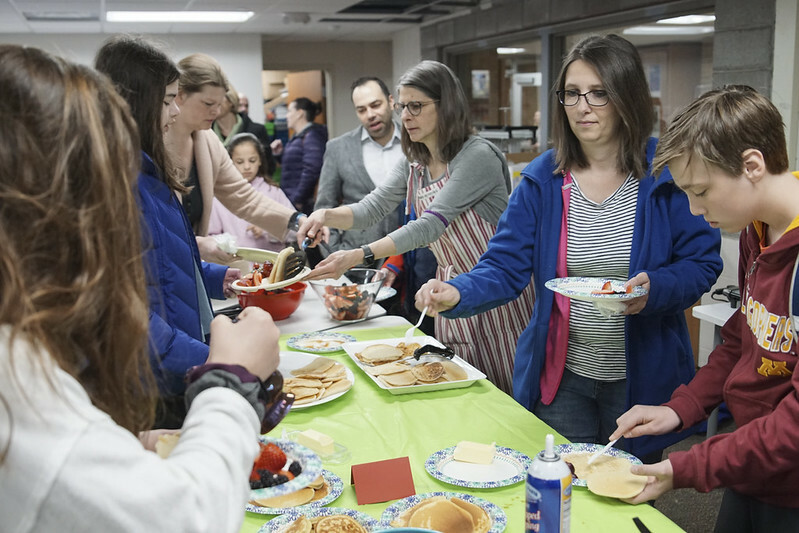 Teachers brought their own griddles for the occasion and even wore aprons as they served food to their students. Following the breakfast, a brief ceremony was held to recognize each student who was awarded. Teachers took turns calling out student names and handed them a certificate for their academic distinction or IB Learner Profile award.